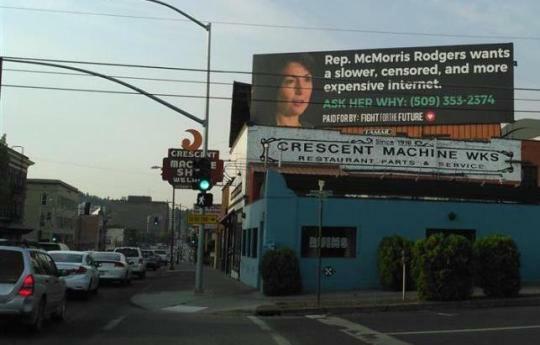 Today digital rights organization Fight for the Future unveiled 3 more crowdfunded billboards targeting Representatives Cathy McMorris Rodgers, Bob Latta, and Greg Walden, members of Congress who have publicly supported the FCC’s efforts to gut net neutrality protections that keep the web free from censorship, throttling, and extra fees. 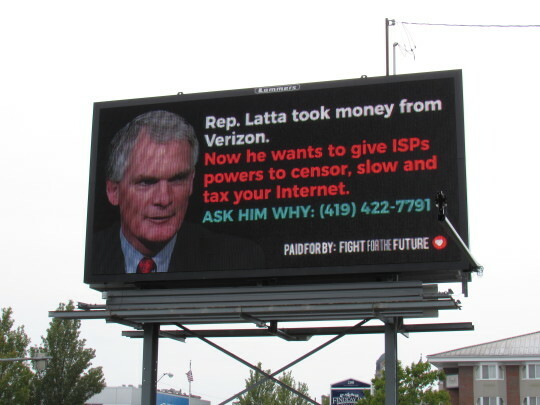 The three new billboards are the latest in an ongoing campaign focused on lawmakers who oppose Internet freedom. 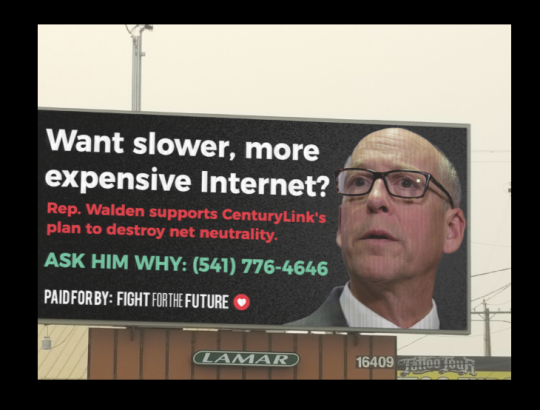 Earlier this month the group launched an initial round of net neutrality billboards targeting six different lawmakers in states across the country. The move comes just hours before the FCC’s final deadline for public input on their controversial plan to repeal net neutrality. With lawmakers still in their home districts, the billboards - paid for by hundreds of small donations - appear in three different states. Since the massive July 12th day of action, millions have contacted their representatives – who have oversight over the FCC – to ensure these key protections are not changed or removed. The billboards send a strong message to any Members of Congress contemplating support for the FCC’s plan to repeal net neutrality, which is currently being tracked through a “congressional scorecard” on BattleForTheNet.com. So far very few lawmakers have been willing to publicly support Ajit Pai’s plan, likely in light of polling that shows voters – including Republicans – overwhelmingly oppose it. The billboards highlight the increasing scrutiny on Congress - who have important oversight authority over the FCC. With no viable legislation on the table, net neutrality supporters remain opposed to any attempt at legislation that would undermine the strong rules at the FCC, which were fought for by millions of Americans, and are calling on lawmakers to publicly oppose Ajit Pai’s plan, and require the FCC to act with transparency and address serious irregularities in its rulemaking process.